In the spring of last year, inspired by a sudden burst of creativity, I decided to venture into the magical and mystical world of online blogging. I’ve been an avid meathead and iron junkie since high school, and I felt it was time to exercise my democratic right to share my thoughts on fitness, nutrition, and life with the world. I had accumulated a fair amount of experience in the various realms of weightlifting— bodybuilding, powerlifting, and crossfit and had devised a methodology which combined all three. 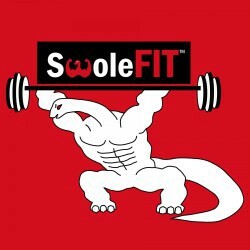 So I launched my blog— Swolefit.com. It was part humor, part useful advice, and (admittedly) a pinch of self serving egotistical ramblings. I soon grew a small readership of bros who were also seeking the path of Swole. With an astounding 200 unique views a day, and active commenters to boot, I felt like I had hit the big time. In order to increase the site’s exposure, I decided to start promoting on message forums, most notably the infamous internet repository of vice, information, wonder, and all things in between: Reddit. Internet commenter: This workout programming isn’t well thought out at all and looks like some brainless meathead wrote it because he wants to do curls which are useless. Me: Actually, I’ve done quite a bit of self experimentation as have my peers, and we’ve all noted some fairly positive results, both in regards to strength gain and a balanced increase in muscle mass compared to traditional Crossfit programming. Internet commenter: How is this even functional? Developing useless muscle mass has no benefit to performing better as a human. Also, you write like a 6th grader and these jokes are juvenile. Me: Hm… well I think there are definitely some people who share the same fitness goals as I do and would be interested in workout programming methodology that mirrors what I’ve devised, of which none really currently exists. And, as a side note, a lot of people have told me they’ve found my writing humorous. I encourage you to try it! Internet commenter: Okay you do your worthless programming, and I’ll stick to what’s PROVEN and what I KNOW works instead of this janky, nonsensical broscience crap. These digital debates, for the most part, never really culminated in any value added discourse. Zealots will be zealots and haters will continue to hate. Even the credentialed fitness icons who I followed online had heaps of negative commenters on their videos, pages, and articles. There were a rare few constructive conversations I experienced online, but for the most part, they yielded little but increased blood pressure. So how should we respond when we put ourselves out there in the spotlight and receive feedback— both negative and positive? First off, we need to take a deep breath and realize that our opinions and ideas come from a limited perspective and are just as prone to error as the next person’s. We need to be willing to read and listen to feedback with an open mind and extract the constructive advice between the emotionally charged lines. Second, we need to acknowledge that we can’t win every argument. It’s just not going to happen. Some people aren’t open to receiving new information and having open discourse about it. And that’s okay. Sometimes, you just have to agree to disagree. If it’s clear the conversation is going nowhere, then just end it. After a day or two, both parties will continue on with their lives and probably forget it ever happened. Finally and most importantly, don’t be deterred by the thoughts of few! It is crucial to continue on in the face of opposition. If we truly believe that what we are saying is right, we can take any useful feedback we are given and use it to better ourselves and mold ourselves into an ever evolving and adapting improvement machine. With these three ideas in mind, I feel that I’m much more at peace and cool headed when I respond to criticism now. And I know when not to respond at all. Silence can sometimes be more effective than any amount of words. Even outside of the digital realm. So don’t be afraid to express yourself and remember that, no matter what happens, life goes on.